When I was at the Macy’s salon getting my hair done I asked the hair dresser what a good shampoo would be for extremely oily roots. I also told her that my ends get very dry so it would have to be mild on the ends. She recommended this shampoo and I have to say I am pretty pleased with the results. My scalp gets very oily. So oily that if I wash it in the morning, by the evening it is already showing signs of oil build up. pimples in my scalp. They are so bad that they resemble pimples one would get on the face. This shampoo has proven very effective at taming my unruly oils and getting deep down into the scalp. I have a bad tendency of picking the pimples in my head. I figure if they are there, clear them out. That is both oil releasing and plain out gross. This shampoo has drastically helped me to not pick the pimples because it rids the oils more effectively and thus does not cause as many pimples. do get are a complete nuisance. 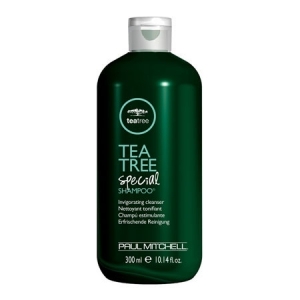 The tea tree and peppermint provide a very deep cleanse into the scalp. The trick with this shampoo is to leave it on for a few minutes so it can do its job. What I usually do is shampoo my hair at the beginning of my shower, do whatever else needs to be done, and then rinse it towards the end. others feel completely invigorated by it. I happen to really like the tingle. I feel like it is lifting away all the junk in my hair. It is a very strong, cool tingle that uplifts the senses. The first time my husband used it he thought it was like a burning sensation. I told him to give it a chance and after a few washes it didn’t feel like a burning sensation anymore. all the other smells. It doesn’t take a lot of peppermint to be noticeably potent and this formula seems to really hold a lot of it. My whole bathroom smells like peppermint by the time I am done. It isn’t the most pleasing of scents but I find it satisfactory. It is necessary in the cleansing. If you don’t like peppermint however, then I highly recommend skipping this product. It is also very expensive. I’ve seen it range from a good sale price of under 30 USD for the liter bottle to well over $30. If you get an oily build up then it just might be worth it though. Peppermint hair-treatments are some of the best you can purchase. Peppermint is a known stimulant that can make you feel very refreshed. After using this, I already felt like a brand new person. I have super thick, rough hair that builds up oils like crazy. Once I completed washing my hair with this, I could already feel a difference. I love Paul Mitchell products you are definitely getting what you pay for. i couldn’t agree more about paul mitchell products. I have always had good luck with them. I too have heard great reviews on the use of peppermint both internally and externally.